When the Packaging Ordinance came into force on 01.01.1993, the German economy was bound by law for the first time to return packaging after use and play an active role in its disposal. Since then the ordinance has been continually refined – most recently with the introduction of the seventh amendment – in order to constantly improve the process of returning packaging and prevent abuse of the system. The Repasack system, developed and introduced by the German paper sack industry 22 years ago, demonstrates how sustainable and successful a system for returning packaging can be. Various collection and disposal systems started appearing in Germany from 1993 following the introduction of the Packaging Ordinance. Six months before the ordinance came into force, German paper sack manufacturers as well as ­German and foreign sack paper manufacturers had already got together to establish their own system for returning, sorting and recycling paper sack packaging in use on the German market. The resulting Repasack system – still the only system for returning packaging founded by an entire sector – has enjoyed continuously high levels of acceptance in industry and among manufacturers ever since. Repasack GmbH was originally founded as a non-profit organisation by 17 German paper sack manufacturers and 14 representatives from Western European sack paper producers. On the one hand, it was founded because the disposal fees for the only comprehensive collection and disposal system in operation up until that point – known as the “Duales System Deutschland” – could easily have doubled the sack price. 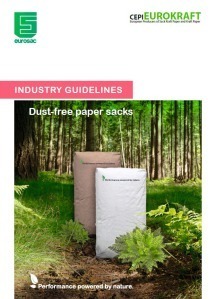 On the other hand, more consistent paper fibre quality can be guaranteed by collecting the sack paper separately. In 2000, Repasack was taken over by ­Interseroh – a Cologne-based private recycling company which in turn has been operating under the ALBA Group umbrella brand since 2008. This has done nothing to harm its popularity among paper sack manufacturers. 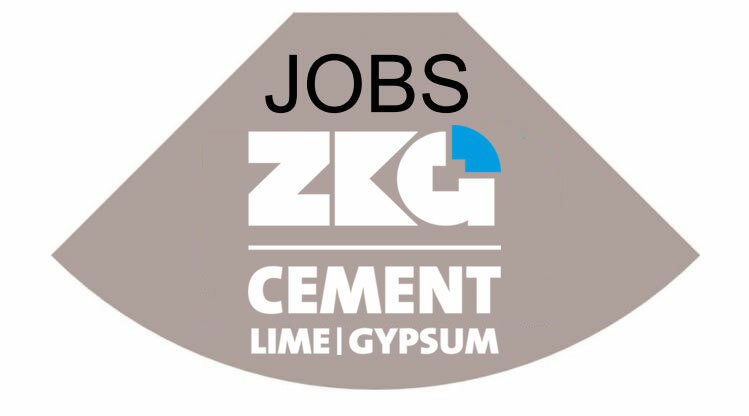 They continue to strongly recommend the system and its added value to their customers. Meanwhile, the number of paper sack manufacturers in Germany has also changed over the course of the years: from a figure of 17 in 1992, the market in Germany is now concentrated across eight companies. Product residue in the form of building materials, minerals, foodstuffs and suchlike can account for up to 20 % of the average empty weight of used paper sacks. This is a real challenge, because being able to return the long kraft paper fibres to the recycling loop rests on the ability to cleanse the used paper sacks of residual material. Furthermore, the sacks must be cleaned without adding water. Thus, a cleaning plant was designed and built at the beginning of the 1990s specially for this purpose. It remains unique in Europe and possibly even the entire world. The residual deposits are reduced to an uncritical level of between two and 5 % in a completely dry mechanical process that uses shredders, flip-flow screens, chopping ventilators and paper separators. 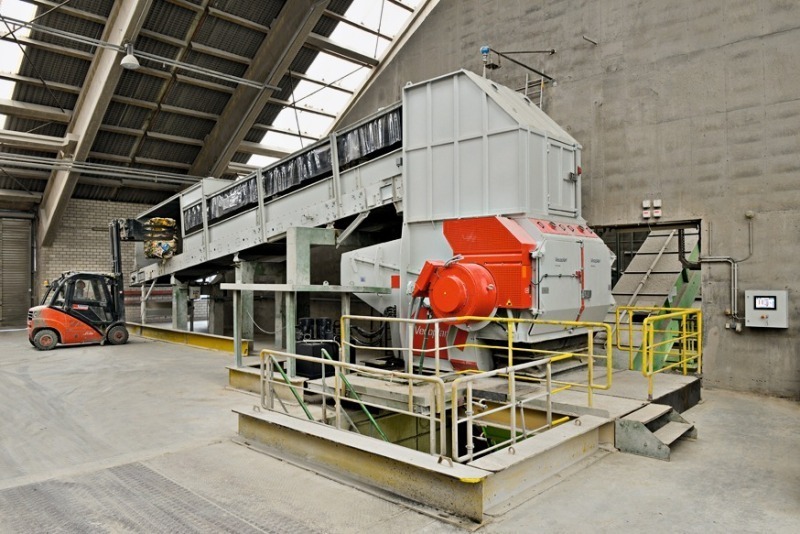 To ensure optimal disposal of the residual material, the used paper sacks are separated into strict material groups before being processed in the cleaning plant. Sacks that have held hazardous goods and those heavily dyed by the contents are separated out and can only be incinerated due to their physical properties. The recycled paper fibres are ultimately returned to the paper-processing industry as a secondary raw material as part of a closed loop. The plant is designed to process a maximum of 35 000 tpa in a three-shift operation. The central element of the system has always been the Repasack symbol, which functions as a “return ticket” for the paper sack, so to speak. 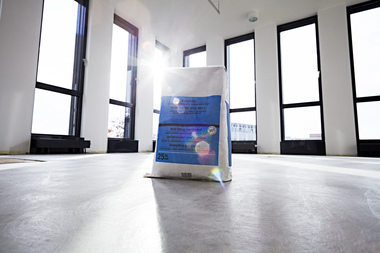 Against payment of a licence fee, companies in the filling industry can have the symbol printed on the paper sacks destined for the German market. 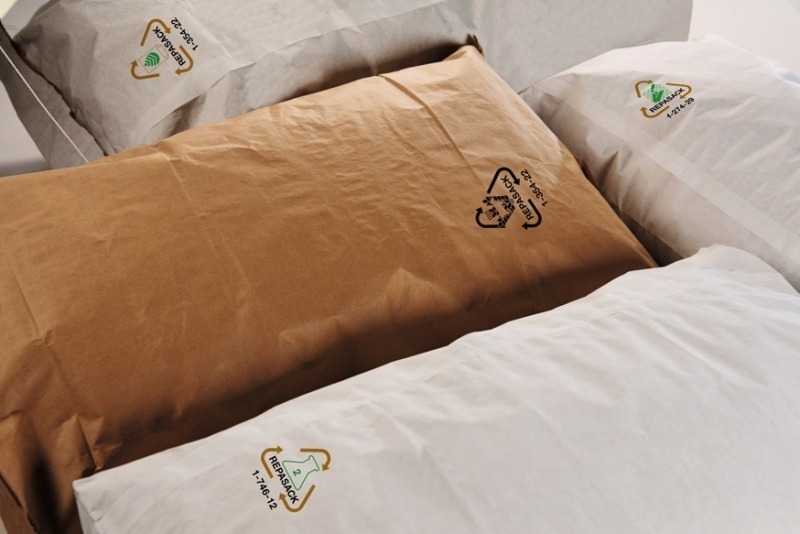 In return, the fillers needn’t worry about their customers – the commercial end users – disposing of the sacks properly, because the Repasack symbol printed on the sack provides the solution. More than 4000 industry customers (30 % of whom are from foreign markets) have already made use of the system since it was introduced. Commercial end customers can return empty sacks bearing the Repasack symbol to the system for disposal very easily and free of charge. A total of 350 collection points are available throughout Germany for this purpose. In addition to all the German companies, ­Repasack works together with around 60 international paper sack manufacturers (e.g. from China, Singapore, Mexico, the USA and many others) that produce their packaging specifically for distribution on the German market. Almost 100 % of the paper sacks collected via the system is recycled, thereby making an active contribution to environmental protection. 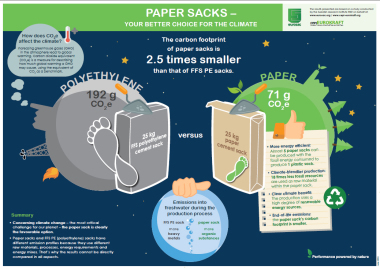 Around 350000 t of paper sacks have been returned and recycled since the system first started. Material recycling has reduced carbon emissions (greenhouse gases such as CO2 or methane) by the equivalent of approximately 75 000 t. Based on average carbon emissions of newly registered cars in Germany of 137 g/km (as of the end of 2013), this is equivalent to more than 547 million car kilometres – or roughly 13 650 trips around the equator. Packaging is simply indispensable for organising the distribution and supply of goods. The use of packaging materials throughout the world is set to rise steadily over the coming years according to forecasts. This growth will be accompanied by a rise in demand for resources and energy and an increase in the amount of waste. Accordingly, above all else, packaging solutions are required that conserve resources, avoid waste and are largely recyclable. “The paper sack and the Repasack system are a formidable team on the path from waste management to recycling management – the system is a model example,” stresses Alfred ­Rockenfeller, chairman of the German Association for the Paper Sack Industry (Gemeinschaft ­Papiersackindustrie e.V.). Incidentally, kraft paper sacks are not recycled behind closed doors: those who are interested can arrange a visit to the unique Repasack cleaning plant in Oberhausen and see the various recycling processes close up.